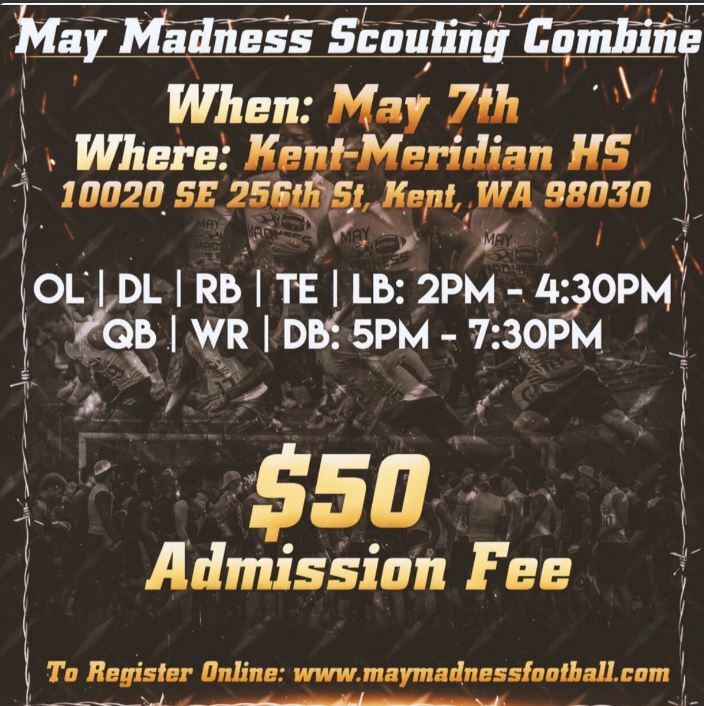 Today is the last Combine event for the May Madness mega football event coming next weekend to the Seattle area. The Top 150 athletes that are found through the Combine and the invitation list will be at the final May 13th. No doubt about it that this Event is one of the Top Football events in the Pacific NW annually. If it is #1 as claimed so be it. That is up to the parents and athletes to judge but May Madness is a new twist in the ever-changing Camp landscape that is offered every year in the Pacific NW. Committing to May Madness, you will have the unparalleled opportunity to showcase your talent in front of a multitude of Media heads. 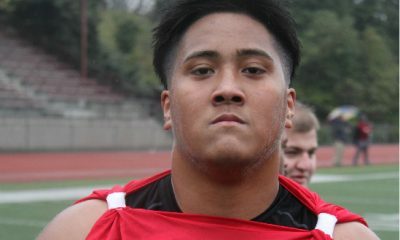 The confirmed media outlets are Scout, 247 Sports, Rivals, Northwest Elite Index, The Oregonian, D1 Bound, Northwest Prep Report, Gridiron RR.com, as well as members from the Under Armor game selection committee, and the US Army selection game committee. For those not familiar with my work we are always critical of claims made by camps. We do not attend camps that have not rightfully earned their place in the landscape of the NW Football scene. We look carefully at the claims made. In 90% of the cases, the claims made are false and designed to separate you from your money. Having attended May Madness in the past and knowing very well Tracy Ford, NWPR puts a 5 Star rating on this event. 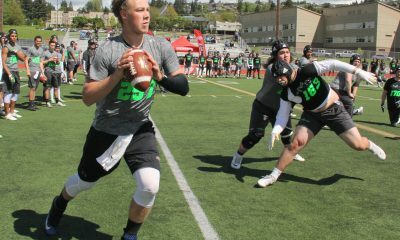 That is reserved to a handful of event like the NW 9 QB Challenge, the Trench-Camp, The Opening, Brian Derby Offensive Line Camps, and the NW Stars Camp. Only the best will be there. In fact, it is likely that 2 out of 3 who attempt access will be turned away. The Camp itself will be knee deep in talent- many athletes attending will have offers or multiple offers. I will say this may or may not be the “#1 Camp” as claimed but everyone says that. The Camp says it has “Produced many top-level athletes” and it has not; only Mom and Dad can do that. Again a little puffery, as we call it is sales, is allowed. Coaching: Athletes will be coached- the staff is highly trained and some athletes will gain insightful knowledge from the staff. This is not, however, a major reason to attend. No real skill can be perfected in a 2 or 3-hour event. Competition: The Combine will expose the best talent in the NW and will also show athletes where they are lacking. Anyone who has a bad day has nothing to lose really. Those having a good day will get a bump for sure. We are not huge Combine fans and there will be debates about a laser versus non-laser 40 time but this is one of the best Combines to take part in. Most camps do not offer this Combine aspect as they have lost their credibility over the years- this one will be run tightly as Ford and his Staff does not play around. Experience: For those who have been to a credible big time camp you know what that is about. It is an athletic freak show. Most athletes hail from teams where the most talented guy on the team, maybe even the hometown hero, will not even be an average guy at these big time camps. Most Camps feature a handful of top talent. At May Madness many will have a reality check- this is a good thing. Too many athletes have D-1 Fever (as do their parents and families and Coaches too). Too many athletes have not a perspective on what a real “dude” looks like. In 18 years of writing, I can say the one thing that is a constant is the perception that D3, D2, NAIA, and Juco Football players are somehow not that good. May Madness will be a day for many to understand that in the end, the D1 guys are the best pure athletes in the world for Football. We hope every athlete goes D1- but annually the numbers indicate that less that 1/2 of 1 player on each High School team actually will. May Madness will be a day to reflect upon and for many a day to readjust where the next few months will take them. Like The Opening: Most football players and recruits know what The Opening is. Nike runs the undisputed best event in terms of talent annually that end up on National TV for 3 days live from the Beaverton Campus. What Tracy Ford has done here is model the camp series and the Finals after that prestigious event- this is, in essence, the best of the best from a number of States coming together in the Finals on May 13th. 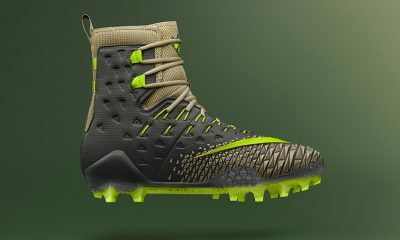 Nike charges no fees because they are Nike. These events cost a lot of money to produce so a fee is needed. Most of this athletes were not eligible for The Opening camps so this is their chance! Exposure: In my view here is the single best reason for attending this camp. If all the Media outlets show up as advertised this is going to be the best option to be seen in the NW this year. So far all the National Networks are planning to attend. More importantly, both NWPR and Northwest Elite Index will be there. We cover all levels, not just the top D1 guys. From that standpoint what we are doing is more important to the kids attending this camp- back to the numbers game. It should be a Day of Days! 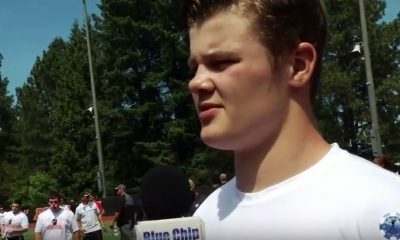 NWPR Recruiting Rule #1: The best camps to attend have College Coaches and Media Analysts at them. If no College Coaches are there the other main reason to attend is if there are Media Analysts there. May Madness is in the Top Tier of all Camps to attend! Under the new NCAA rules, College Coaches will no longer be at Satellite and Mega-Camps. This means that in order to be seen by a Colleg Staff athletes will have to attend Camps at Colleges. A word of advice, redo- your offseason schedule to only attend events like May Madness (there are very few) and attend College Football camps. Many colleges offer a 1-day experience or will accept you as a drop in recruit. May Madness is a textbook example of a must-attend event under the new Paradigm of High School Football recruiting. In my opinion, the May Madness Combine is similar to attending a collegiate summer camp. If your son wants recognition for his potential athletic talent or you need to determine whether your son wants to step up and compete with others, paid the $50 to attend the combine. If by chance your son earns an MVP award or selected to the May Madness Invitational, he better bring his “A” game and the yearning to learn.